Flames flickered about on a band logo that looped all through DATU's set, and so did their performance. Set on developing a sort of "Filipinx Futurism," Toronto producers Romeo Candido and Alexander Junior have built an impressive repertoire incorporating everything from soul and R&B to house and the traditional gong music of their ancestral Philippines. Their set at Camp Wavelength illustrated this range, but, unfortunately, it also neglected to deliver the energy that's garnered them into some well-deserved acclaim. 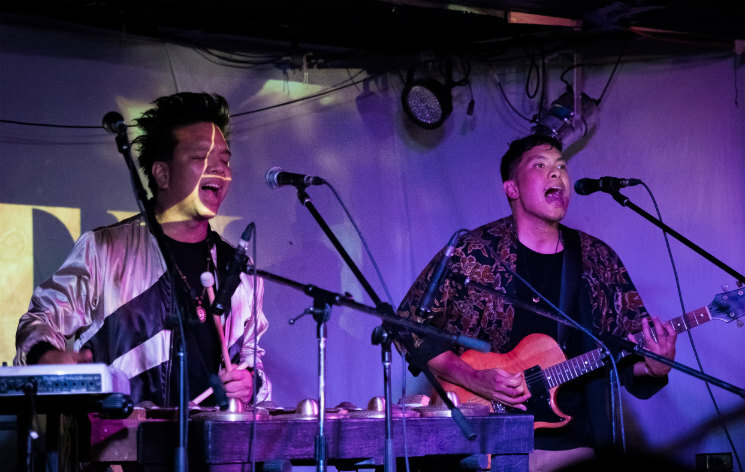 After building steam with a pair of hip-hop- and house-oriented instrumental pieces, a contextually powerful piece of traditional kulintang felt like too much of a divergence. Going through the motions displaying the diversity of their catalogue, they never managed to get to the energy they've bottled on expanded crew love-ins like "Halo Halo Man" or "World Gong Crazy" (granted, without local rapper Han Han on hand to deliver her verses, an attempt at the latter might have been ill-advised). Guest vocalist Victoria Marie brought a smouldering, gong-inflected cover of Katy Perry's "Dark Horse" and stoked the dreamy R&B-scapes of "SUNS" (further augmented with HATAW's Fly Lady Di busting serious moves), but by the time DATU closed with a cover of Santa Guerrilla's "Vinta," it felt like they were just getting started — hot enough to warm you to the vibe, but too disjointed to supply the fire they're fully capable of.